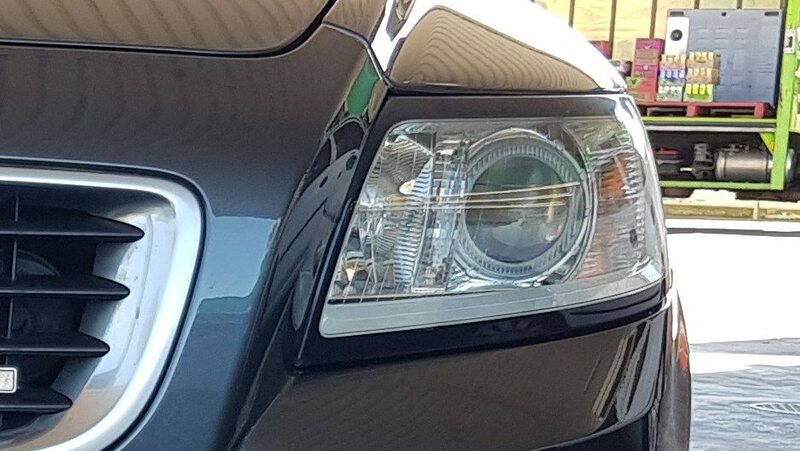 How do I tell if the high beam low beam [the centre round light] is halogen or xenon on my 2009 Volvo S40 2.4i? 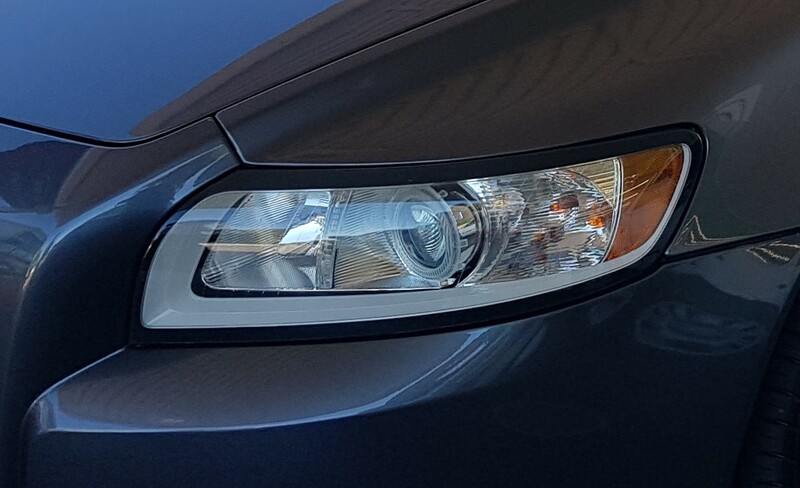 This is what the headlights look like. Look at the headlight switch. If it has 2 thumb wheels for dimming and height then it's halogen. HID must be auto level by ADR's. They look like Halogens as HID usually has a light blue halo. Actually, reading your question as it's written.... High beam is always halogen. Low beam can be either. Sorry, I should have said "low beam" [edited it]. It is the centre round light in the photo that I am wondering about. My headlight switch has a single thumb wheel for adjusting the height of the beam. So are they halogen lights? 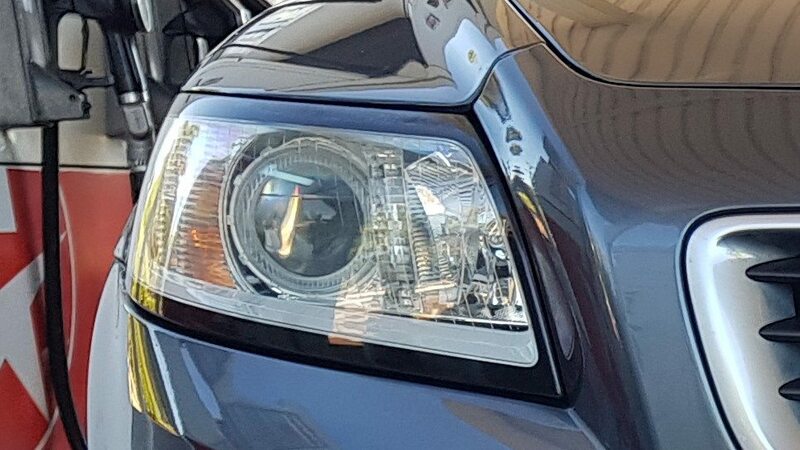 I wonder if someone has retrofitted xenon lights, or replaced the switch with one that has beam height adjustment. Because as far as I know, no xenons had the adjustment, but yours definitely look like xenons. Does the adjuster actually work? The switch for the levelling of the headlight does indeed work. As I said, when I scroll the thumb wheel, it moves the lights up and down. Sitting inside the car and shining the lights onto the garage door, they definitely move up or down according to how I scroll the thumb dial. The car was originally an ex-dealer demo. A Volvo spare parts centre told me that the dealership quite probably spruced the car up a bit as a demo model. It has an R Design body kit, steering wheel, shift lever, floor mats, side mirrors, foot pedals, the R Design style metal facia on the centre console and door handles (where the electric window buttons are), 17 inch mags, and the front grille badge, but no rear R Design boot badge. It also has a couple of unexpected options too like the 8 speaker premium sound system, grey leather seats, push button switch for the child safety door lock feature, and a sports chassis. But it is just a normally aspirated 2.4i. So could it be it has xenon headlights fitted as a dealer demo option too? And they left the beam leveling switch still connected? I guess it's also possible that you could get adjustable levelling with the HID lights, although I'm sure I read there was a legal requirement for HID's (xenons) to be auto-levelling which is why they didn't have the adjustment knob. They are 100% halogens. HID retro fitted kits are illegal. Factory HID's have sensors on the suspension to automatically lower the headlights when weight is added to the boot. 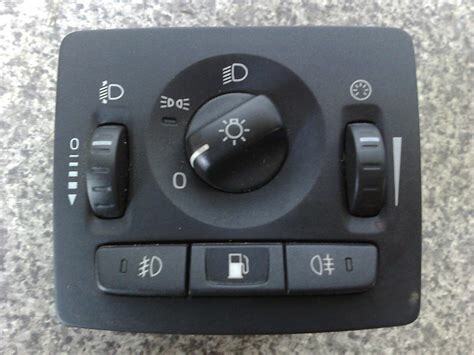 The headlight switch for HID's also only has the single thumb wheel on the right. The globes fitted in the low beams are H7. My 09 V50 2.4i R design has all of the features you talk about and the same headlights. I don’t know the correct terminology but the headlight globes are much the same as those on a 240. A mate has an AWD T5 V50 just a tad older than mine, he has the fancier lights that move and level out as you switch them on each time. The light output on these is a LOT better.